It's the school holidays here and I like to start work early so that I have some time with my family. It's very peaceful first thing - my husband doesn't come down until about eight o'clock and the two older children don't surface until later. But my youngest son is an early riser (and also a sociable personality!) so we sometimes craft together until the hustle and bustle of the day begins. Do you remember the adventurous Mr Rabbit, who found himself adrift on the high seas? (He's on this card on the left.) Well, you'll be glad to know, he was rescued by friendly fish and found himself a new home in the Warbling Woods. Here he is on his way to a birthday party! The card came together very quickly. I wheeled Funky Forest across a Whisper White card base, then adhered Patterns DSP in Old Olive below it. 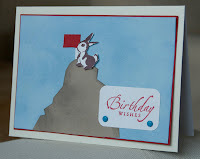 The Right on Track 'fence' was wheeled across that and across a cut-out Mr Rabbit (oops! he's the wrong colour!) and then he was attached to the matching part of the fence so it looks as if he's behind it. Some balloons coloured in with a blender pen, a sponged sky, some cut-out Trendy Trees for the woods, a sentiment - and voila! It was done! I can't resist showing you the card my son made this morning. 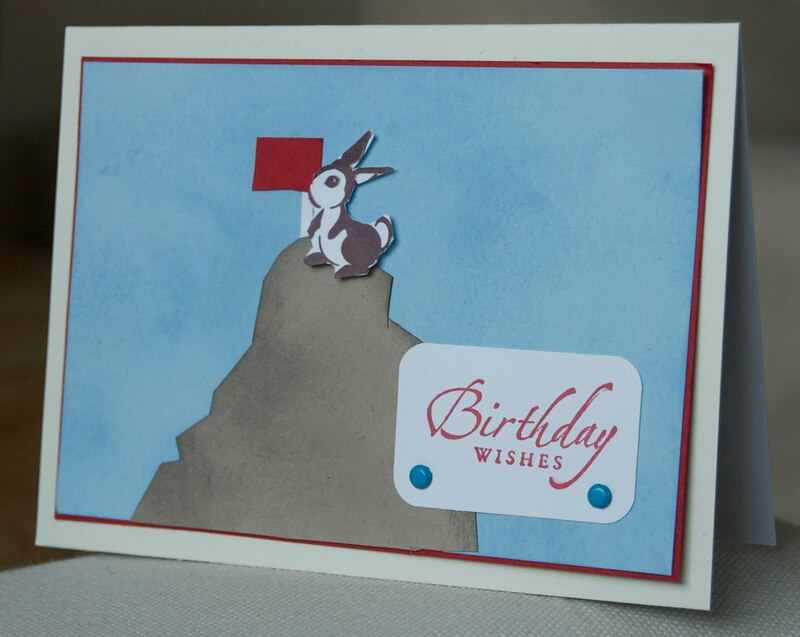 His Mr Rabbit IS the right colour and look - he's having another adventure! My clever boy - he did everything himself apart from the matting. Just look at that professional sponging! Crafting is a lovely activity that all ages can enjoy together. And if you do it with someone under ten you might get a story thrown in for free! 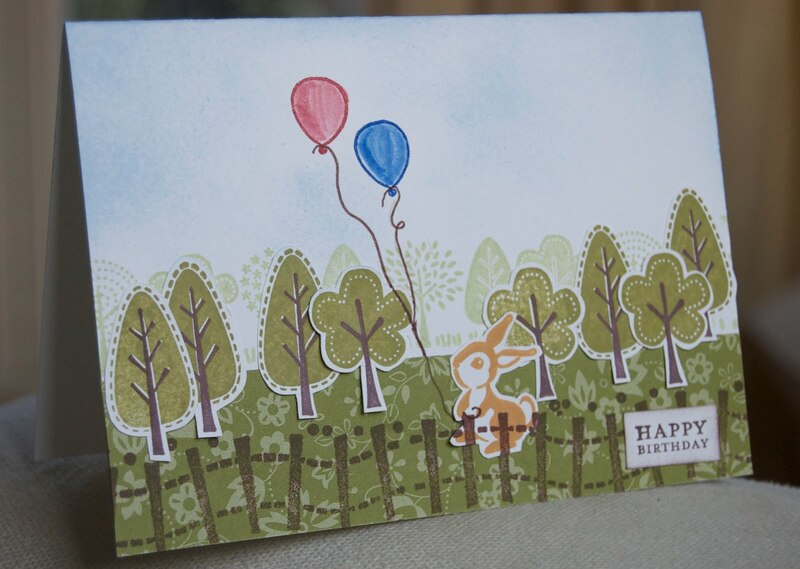 Such CUTE cards, Vicky! Your second one is especially clever. Love the way you layered the wheel images with the cut-outs and the designer paper. Fabulous and so clever! Your son's card is so great. I love crafting with kids. They always have unique ideas and put such an interesting spin on their projects. Tell him one of your U.S. friends says to keep up the good work!